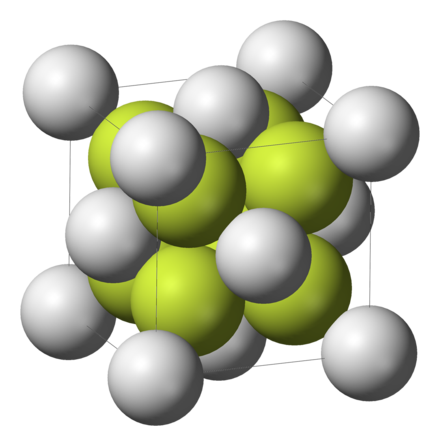 Aluminium oxide (British English) or aluminum oxide (American English) is a chemical compound of aluminium and oxygen with the chemical formula Al2O3. 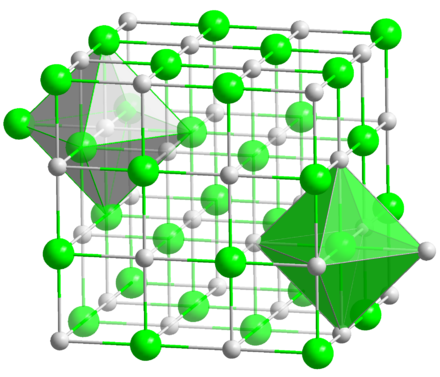 It is the most commonly occurring of several aluminium oxides, and specifically identified as aluminium(III) oxide. 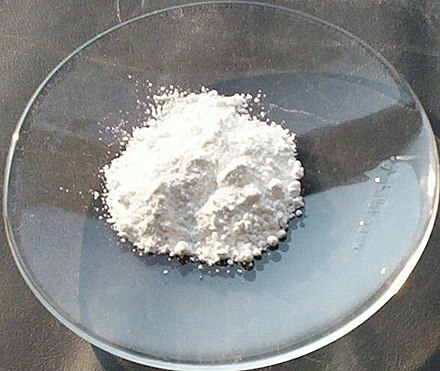 It is commonly called alumina (regardless of whether the element is spelled aluminum or aluminium), and may also be called aloxide, aloxite, or alundum depending on particular forms or applications. 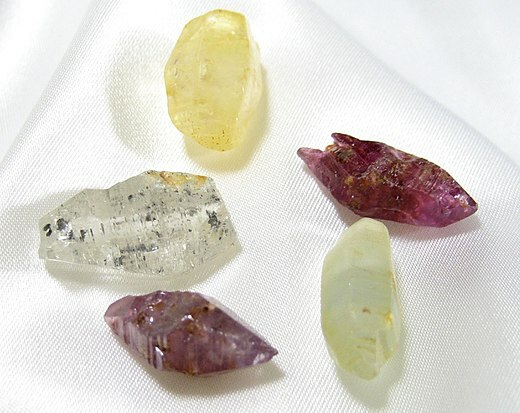 It occurs naturally in its crystalline polymorphic phase α-Al2O3 as the mineral corundum, varieties of which form the precious gemstones ruby and sapphire. 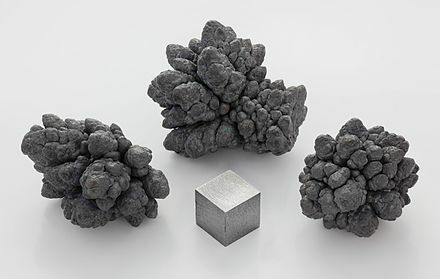 Al2O3 is significant in its use to produce aluminium metal, as an abrasive owing to its hardness, and as a refractory material owing to its high melting point. 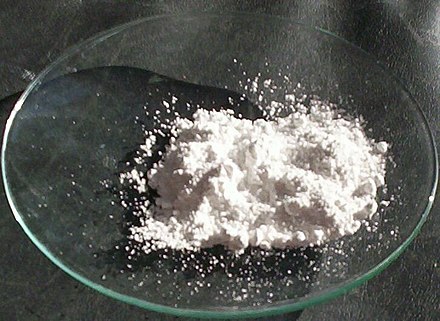 Aluminium oxide in its powdered form. 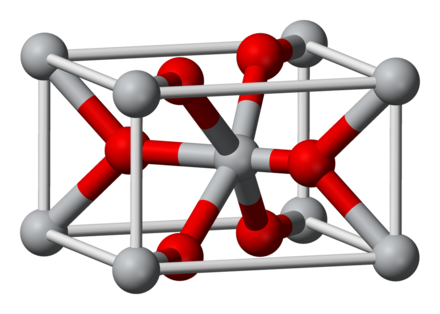 Aluminium oxide is an amphoteric substance, meaning it can react with both acids and bases, such as hydrofluoric acid and sodium hydroxide, acting as an acid with a base and a base with an acid, neutralising the other and producing a salt. Corundum from Brazil, size about 2×3 cm. 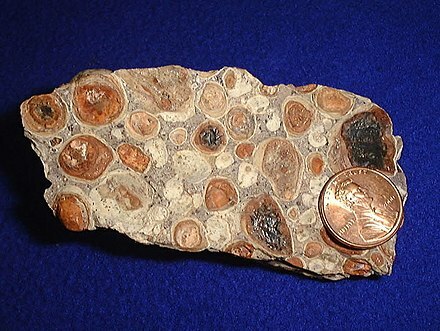 Except for SiO2, the other components of bauxite do not dissolve in base. Upon filtering the basic mixture, Fe2O3 is removed. 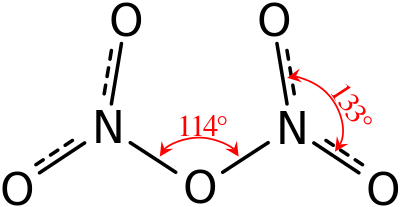 When the Bayer liquor is cooled, Al(OH)3 precipitates, leaving the silicates in solution. 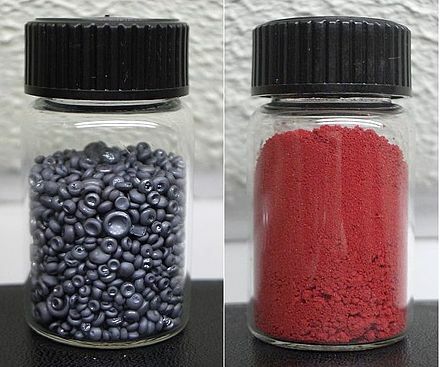 Aluminium oxide can be grown as a coating on aluminium by anodizing or by plasma electrolytic oxidation (see the "Properties" above). 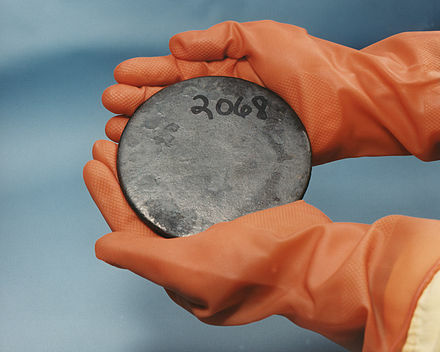 Both the hardness and abrasion-resistant characteristics of the coating originate from the high strength of aluminium oxide, yet the porous coating layer produced with conventional direct current anodizing procedures is within a 60-70 Rockwell hardness C range  which is comparable only to hardened carbon steel alloys, but considerably inferior to the hardness of natural and synthetic corundum. 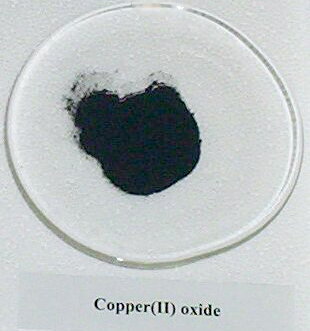 Instead, with plasma electrolytic oxidation, the coating is porous only on the surface oxide layer while the lower oxide layers are much more compact than with standard DC anodizing procedures and present a higher crystallinity due to the oxide layers being remelted and densified to obtain α-Al2O3 clusters with much higher coating hardness values circa 2000 Vickers hardness. 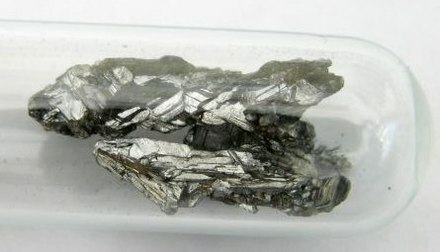 Indium and Gallium. Blackie Academic. ISBN 075140103X. ^ Akers, Michael J. (2016-04-19). Sterile Drug Products: Formulation, Packaging, Manufacturing and Quality. CRC Press. ISBN 9781420020564. 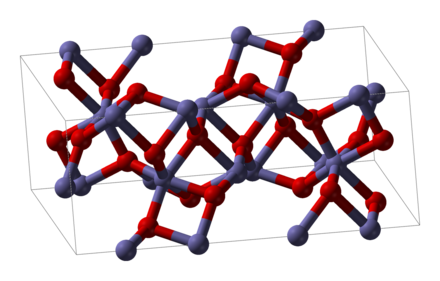 ^ Hudson, L. Keith; Misra, Chanakya; Perrotta, Anthony J.; Wefers, Karl and Williams, F. S. (2002) "Aluminum Oxide" in Ullmann's Encyclopedia of Industrial Chemistry, Wiley-VCH, Weinheim. doi:10.1002/14356007.a01_557. ^ Mallick, P.K. (2008). Fiber-reinforced composites materials, manufacturing, and design (3rd ed., [expanded and rev. ed.] ed.). Boca Raton, FL: CRC Press. pp. Ch.2.1.7. ISBN 0-8493-4205-8. ^ Joseph H., Osborn. "understanding and specifying anodizing: what a manufacturer needs to know". OMW Corporation. Archived from the original on 2016-11-20. Retrieved 2014. Check date values in: access-date= (help) ^ Li, Q; Liang, J; Wang, Q. "Modern Surface Engineering Treatments, chapter 4 Plasma Oxidation Coatings on Lightweight Metals" (PDF). INTECH 2013. Archived (PDF) from the original on 2016-03-04. ^ "GE Innovation Timeline 1957–1970". Archived from the original on 16 February 2009. Retrieved 2009-01-12. ^ "DailyMed - JUNEL FE 1/20- norethindrone acetate and ethinyl estradiol, and ferrous fumarate". dailymed.nlm.nih.gov. Archived from the original on 2017-03-13. Retrieved 2017-03-13. ^ Belkin, A.; et., al. (2017). 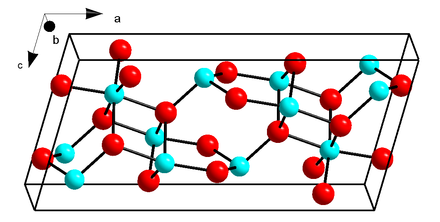 "Recovery of Alumina Nanocapacitors after High Voltage Breakdown". Sci. Rep. Bibcode:2017NatSR...7..932B. doi:10.1038/s41598-017-01007-9. ^ Farndon, John (2001). Aluminum. Marshall Cavendish. ISBN 9780761409472. Archived from the original on 2017-12-04.